An entertaining peek into the life of a standup comic, that unfortunately doesn’t go anywhere until the final portions of the film. The Comedian is an indie movie about an aging stand up comic. DeNiro is beck on stage doing comedy routines for the first time since the King of Comedy, and boy have things changed. The movie embraces the world of the comic nicely, loaded with insults and roasts (it was written by “roast master” Jeff Ross.) And as far as story goes, it’s abiut understanding this guy’s relationships. But to a certain extent, it doesn’t go as far as one might have hoped. The movie often times feels like an attempt at emulating the plot of a standard romantic comedy, with characters getting together and then splitting up. But the dynamics between DeNiro and the other actors here (like Harvey Keitel,) are fun, and the movie manages to be pretty entertaining. The Comedian is an interesting movie. It’s one of those films that played the film festival circuit, but never got much of a theatrical release. This is the kind of movie they used to make and release during awards season, and now it barely finds life on the shelf. In today’s changing time, it’s all about the big names (sorry DeNiro, but today’s audiences are hungry for new talent, not old talent.) It’s all about superhero franchises and action movies. A comedic drama like this movie never really stood a chance. But despite how it did in terms of popularity, the movie is actually pretty entertaining. Having never heard of it until I saw it on the shelf, (yes, I’m just as bad as the masses in that department,) the cast is so stellar that they stand out and leap off the box. DeNiro doing stand up? That last time anybody saw that was in the great Martin Scorsese flick The King of Comedy. Leslie Mann, Danny DeVito, and Harvey Keitel. These are stars of a different day (at least with the later two,) but they’ve got nostalgia. Keitel and DeNiro, in particular, go all the way back to Mean Streets and Taxi Driver, where they started their careers. Any time these two get back together again (like in Cop Land,) it’s a welcomed opportunity. Unfortunately, this movie is no Cop Land. It might be about a stand up comic, but this film is much more drama than comedy. It’s about this aging performer (meaning he’s old,) who still gets out there, on stage, but has no time for the nonsense of today’s culture. So in the opening scene, when he performs for a tiny club out in a the middle of Long Island, and finds a customer recording his set, on a cell phone, DeNiro’s character, Jackie, blows up. It turns out this customer is not only recording Jackie, but also has her boyfriend heckling Jackie as part of his Webisode series he calls Comedian Take Down. Of course, he announces all of this, which is the movie’s way of telling us this is a clash between the old (Jackie,) and the new (Webisodes,) but the customer isn’t exactly a youth. He’s more of an overweight bearded biker type. So the old vs young idea isn’t quite as clear as it should be, but despite some of these early flaws, the movie still moves along nicely. The webisode situation at the comedy club leads to Jackie punching the guy out and getting some jail time. We follow Jackie to the trial where he refuses to apologize to the man. And then it’s off to prison and community service. We don’t really see much of Jackie’s prison sentence (other then the guards and inmates welcoming him by singing the theme song to his nostalgic show “Eddie’s Home.” But after prison, it’s right to the soup kitchen where Jackie has to do his hours of community service, and that’s where we meet the girl who will become the love interest of the movie. Leslie Mann plays Harmony, a woman who has let her temper get the better of her in life. She’s a whole lot younger than DeNiro, but these days that doesn’t seem to matter much, (witness DeNiro getting it on with Aubrey Plaza in Dirty Grandpa.) DeNiro walks over to the office in the soup kitchen to get his paperwork signed, and catches Harmony on the phone with an ex, yelling at him. Jackie convinces here I go out for a drink with him, and that’s where we get the story of how she threw a lamp at the girl she caught her boyfriend in bed with. To add a little more to the mix of characters here, we meet Jackies brother, James (Danny DeVito, and his brothers wife, Florie (Patty LuPone.) The two of them own a deli, and Jackie comes to visit, looking to borrow money. It’s his first time coming by in a very long time, and the conversation reveals that he doesn’t even know how many kids his brother has. Even still, he gets an invite to the wedding of James’ daughter’s wedding. And that’s where the deal between Jackie and Harmony comes in. She’ll go to the wedding with him if he comes out to her father’s birthday dinner at Sparks Steakhouse with her. Both situations turn out to be nightmares. At the wedding, Jackie gives a speech that turns into more of s roast. And at the birthday dinner, Harmony’s father (Keitel) won’t let up on Jackie about the character in the show he used to on. Jackie just wants to be treated like a regular person and Keitel keeps insisting that Jackie day his catchphrase. It gets pretty ugly. By the end of all this, Jackie and Harmony are riding on such a high from their two evenings out together that they do end up sleeping with each other. And then they stop talking to each other. Jackie keeps calling Harmony and she stops returning his calls. At this point we are about three fourths of the way through the movie, and it’s fallen into the trap of most romantic comedies, having the characters separate from other and go different ways. Luckily there’s a new angle, towards the end of the film, that serves as a sort of resist to reel it all back in. And at the end of the day, that twist becomes one of the most unique and creative parts of the movie. It’s the first moment in the movie that shows any sort of character change or development. 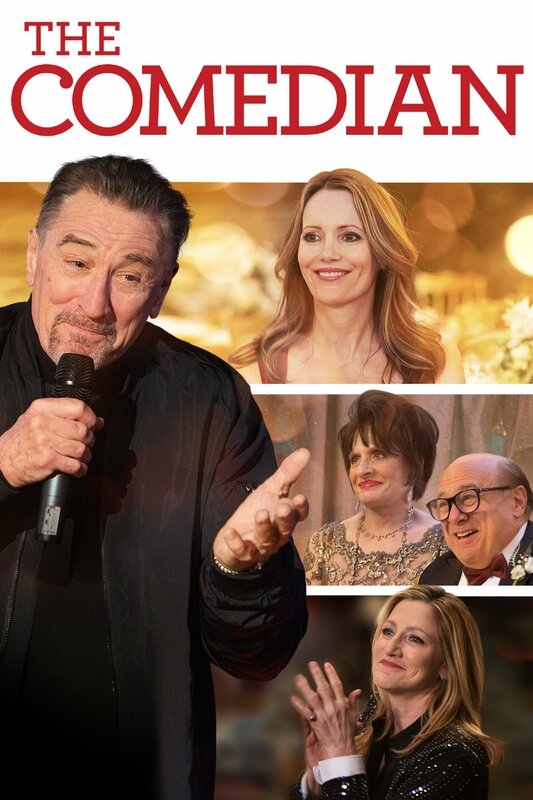 And what we are left with is a movie about an aging stand up comic and his relationships. We don’t get to see as much of the life of a standup as we might have liked, (we never see where Jackie lives, or see him working on material.) Instead, we get a movie about this one stage of Jackie’s life, where he met Harmony and their time together forever changed him. It might not be everything we were hoping for, but it’s enough. And it definitely makes the movie a worthwhile and pleasant experience.